I remember telling my nieces how God numbers the hairs on their heads. Kristin and Katie both gave me this incredulous look. I am awed by that too but ...it's a fact. 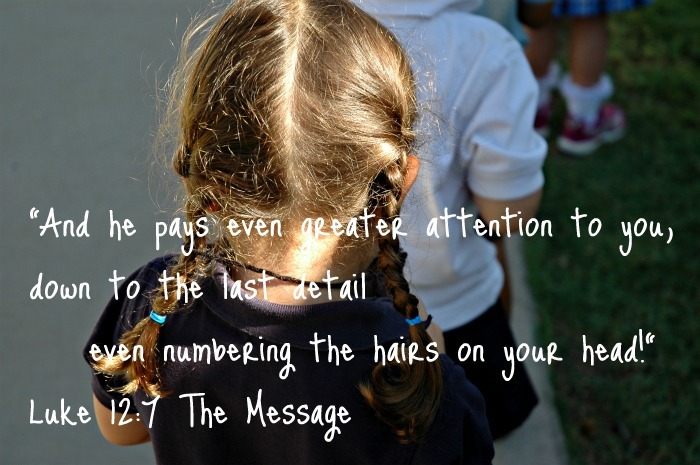 How thankful I am that God knows all about me; even down to the tiniest detail like knowing how many hairs are on my head. I'm linking up with the Internet Cafe for Word-filled Wednesday. I'm always amazed at how you and I end up in the same thought process! lol I've been thinking about this very thing and in my prayers have been thanking God that he cares about the smallest details of what we're going through. And we are of more value than the sparrows, yet He cares for them. This also reminded me of the verse that says we are the apple of God's eye. Wow!! What an incredible thought! It's interesting how a simple reminder like this can change everything! Blessings! Isn't that just so amazing! I agree with you and love the picture. What a sweet, sweet, picture! It's such a lovely way to illustrate this amazing portion of scripture. all the little birds on the feeder. Do You Want to Become a Mentor?